The new school is well underway - it will change the kids' lives forever. This morning, as I was getting ready for work, my wife and I were talking about plans for January. We’re going to South Africa for three weeks over Christmas to see family in Johannesburg, and I’m planning to make my way up to Simakakata in Zambia while we’re there to see George and the school and find out how things have changed in the last year and a bit. The only question was whether I’d try and squeeze it in for a few days before Christmas, or arrange to stay on for an extra week or so after Tamsin and Tabby go home. On the one hand, doing the latter gives me more time to visit Good Hope as well and shoot lots of video for a story I’m putting together, on the other I’m terrified about spending six weeks out of the office. Especially as that time of the year is usually quite busy for freelance journalists, filling in while everyone else takes the holiday off. As we were talking about it, I got a text from Sonia – perhaps the woman I admire most in the world. I haven’t spoken to Sonia since last May – I’ve only got George’s mobile phone number and she’s not been at school when I’ve called. A simple text, just to let me know her number. I’m not a believer in signs and all that, but the coincidence has made my mind up. I’m calling to change my flights to the later one today. Only one question remains. I want to make sure that I’m not going back empty handed, so plan on doing some fundraising for LearnAsOne before I go. 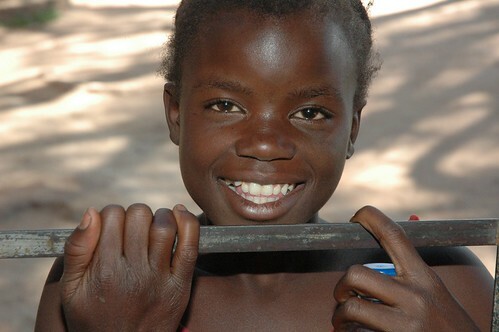 Saviour - the eight year old AIDS orphan who's now top of her class. There won't be any computers in the new school though - running water will be the first priority before power. So far, three classrooms have been built using bricks made by the community and extra building materials bought with donated cash. It’s been absolutely life changing – Saviour is now top of the class and well on her way to achieving her ambition of becoming a teacher. The government has agreed to send more teachers, and there’s even an unfinished borehole been sunk. In order to improve the quality of teaching and take more children from the community beyond grade six, more classrooms and teachers’ houses are needed. George still needs more help running adult education programs and maintaining his HIV/AIDs health outreach volunteers. The community are desperate to build the school and throwing all their weight behind it – they’ve seen how, in nearby Good Hope, an entire town has built up around the school turning an improverished, disparate community into a developmental success. They want to repeat that in Simakakata, but need just a bit more cash to buy things like windows, roofing timber and desks that they can’t build themselves.